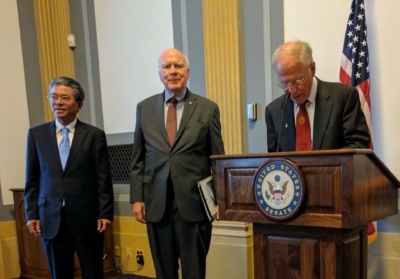 On June 28, Senator Patrick Leahy of Vermont and Vietnamese Ambassador Pham Quang Vinh spoke at a screening of “Chau, Beyond the Lines” on Capitol Hill. This ground-breaking film was nominated for an Academy Award in 2016 in the short documentary category, and tells the story of a young Vietnamese artist born with disabilities believed to be linked to his mother’s exposure to Agent Orange and his quest to become an artist. Several hundred thousand Vietnamese children and young adults are burdened by disabilities linked to dioxin exposure of a parent, grandparent, or great grandparent. Lê Minh Châu, or “Chau,” the focus of Courtney Marsh’s film, is one of them. For 35 minutes, “Chau, Beyond the Lines” follows Chau over a period of seven years as he faces each seemingly insurmountable physical and psychological challenge to reach his dream and ultimately succeeds in becoming a professional artist. Through Chau’s story we see that the legacy of Agent Orange is both real and a humanitarian concern we can do something about. “Chau, Beyond the Lines” is currently available for streaming on Netflix. To learn more, visit the film’s website at www.beyondthelinesfilm.com. For nine years during the Vietnam War, U.S. forces sprayed Agent Orange and other defoliants over large areas of South Vietnam, Laos and parts of Cambodia to deny forest cover and food crops to the opposition. Agent Orange was found to be contaminated with dioxin, a highly toxic and persistent organic pollutant, now linked to cancers, diabetes, Parkinson’s disease, other illnesses, and birth defects. The legacy of the wartime spraying continues to impact the health of Vietnam veterans and their families as well as others living in Vietnam and Laos. Dioxin continues to contaminate the soil on several former U.S. military bases in Vietnam and poses a current public health threat to nearby residents. 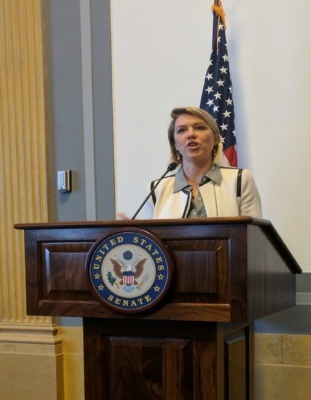 In 2007, the U.S. and Vietnam began working together to clean-up residual dioxin in the soil at former U.S. military bases and to support programs that provide services for Vietnamese with disabilities, particularly those who live in heavily sprayed areas. This program is an example of continuing close cooperation between the U.S. and Vietnam on a war legacy issue. Congressional appropriations, supported by Senator Leahy, have totaled $201.2 million for these purposes. The benefits have been significant, both for strengthening the bilateral relationship and as a response to a humanitarian need.